With a nickname like "The Jet", it is not hard to figure out that Jimmy Cunningham was a speedster and a dangerous weapon as both a receiver and kick returner. Cunningham signed as a free agent with the Toronto Argonauts in 1995,a and would play two seasons (1995-96) with the double blue. In his rookie season, Cunningham was used mainly as a kick returner and had 3 touchdowns on only punt returns. Cunningham really broke out in his second season in 1996 with 603 yards on kickoff returns, 976 on punt returns (two more for touchdowns), 160 on missed field goal returns and an even 800 yards on 62 pass receptions. Total those numbers up and Cunningham led the CFL in combined yards. Cunningham was also named a CFL All-Star as a special teams player. After the 1996 season, Cunningham signed as a free agent with the Buffalo Bills of the NFL. After his release by the Bills, Cunningham returned to the CFL in Ocrtober of 1997, signing with the BC Lions, but only playing one game. 1998 was also a bit of a washout for Cunningham as he played in only 4 games, but once again still had a punt return for a touchdown. Cunningham got back on track in 1999, with his first thousand yard season returning kickoffs with 1032 yards, including one returned 98 yards for his only career KO return touchdown. 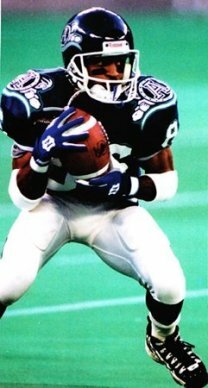 Cunningham also had two more punt returns for TDs in 1999, leading the league again in combined yards and winning a second CFL All-Star on special teams. In 2000, Cunningham had another thousand yard season on kickoff returns with 1090, but no return TDs and his punt return average dropped to a career low 5.9 yards. Apparently the Lions thought The Jet had run out of fuel, and he was released after the 2000 season. Cunningham playd in the XFL in 2001, and tried a comeback with the Argos in 2002, but that lasted only 4 games. Cunningham was on two Grey Cup winniers. In 1996, Cunninham won the Grey Cup with the Argos and contributed a punt return for a touchdown. Cunningham was also with the BC Lions in 2000 when they won the cup.